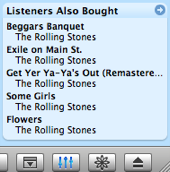 I noticed after opening up iTunes that a new bar appeared on the bottom of the window. Then, I realized that it was a little iTMS sitting right there below my library. Then, when playing a song, the window would change to a “related songs” format, displaying songs that others bought that bought my song. I like the idea, but it is obviously trying to get some more traffic into the iTMS. It kind of reminds me a bit like Google, the way they personolize the ads to you. But for now, I just made it go away by clicking on the little icon below it.